Mya Hall died on March 30, 2015 after an incident involving her crashing an SUV into a police cruiser near the gates of the Baltimore NSA. She was a 27 year old black, trans woman. Simply living life as a black, trans woman puts her in an incredibly vulnerable state considering the cards stacked against her existence in the form of racism, transphobia, sexism and so much more. In the 90 minutes I spent reading news articles about the day she died, she is described by the media in the most harsh way 98% of the time. Only 1 article I read talked to people she knew in some of the communities she was part of and a couple of her past lawyers. They all had good things to say about her and respected her. The media awkwardly handled the that fact that she was a transgender woman, randomly mixing in the name she was born with and using pronouns inconsistently/incorrectly. If a person is described as a homeless prostitute with a criminal record who is facing prison time who took drugs, stole a car and disobeyed orders of government officials does this mean they somehow deserve to die more that someone else? Having the right to live your life should not need to include such details. Breaking laws and disobeying police is not a reason to end someone’s life. Except that black lives are ended by police alarmingly often for no reason at all. Our government, and many others, justify killing massive numbers of people all the time to “protect their secrets.” And most of the “secrets” involve how they are manipulating everyone and everything for the gain of the privileged few. It’s not a secret anymore, most of us know and we passively or actively ignore the information and it’s vast, grave consequences. We hope to stay comfortable and not ever be served the physical, emotional and spiritual bill for the astronomical death toll that created and upholds white supremacy. Whether they shot her or shot her car which crashed and killed her, I have no doubt that the NSA killed Mya Hall for refusing to halt to their commands. I don’t know exactly what happened because I don’t really trust all the different versions of the events that were reported. I do know that the media reported all the most controversial parts of her life and none of her personality or who she really was. They didn’t mention anything about the NSA officer(s) that killed her and injured her partner. They offered her no grace or respect and printed no remorse for the loss of her life. I don’t know what should happen in an incident like this, but if we think that we aren’t collectively responsible for the reason she was high on drugs in a stolen car with a criminal record facing jail time, then I think we are dead wrong and deeply in denial. Being alive in a black body and living as the gender that you are should not be something that ruins people’s lives and puts them at such great risk with so little support. 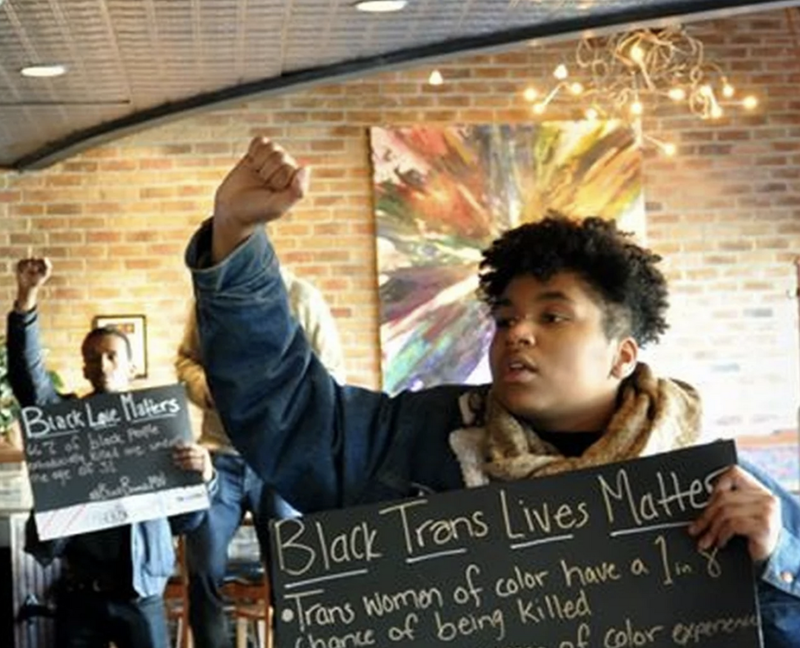 Black, female, tran lives matter. Mya Hall’s life matters. Our government and much of white america consistently behave as if these statements (and thousands of similar statements) are not true. It’s not okay.